Having recently received some Pura coffee to review (more on this soon), I was keen to try it out in some baking. As some of you may have gathered by now, I am currently heavily into biscuits. I typed coffee and biscuits into Eat Your Books and came up with a recipe for Manhattan Cappuccino in Cooking with Chocolate by Frederic Bau. This involved stacking bought rectangular butter biscuits into elaborate structures to mimic the Manhatten skyline. Whilst this was way too elaborate for me, the coffee chocolate ganache used to glue the biscuits together was something I did want to make. I would make some biscuits and use the ganache to sandwich them together. Fortuitously, I came across a recipe for coffee biscuits over at Blue Kitchen Bakes just as I was debating what biscuits to make. This then, would be the recipe that I based my coffee biscuits on. I chose a heart shape which seemed appropriate given the proximity to Valentine’s Day. I could of course, have easily made the biscuit mixture by hand and if I’d done so, I’d probably have creamed the butter and sugar together as suggested in the original recipe. However, I’d just made some pastry in the food processor, so it seemed sensible to use it for these biscuits as well. Given that coffee flavoured bakes are low on my list of favourites, I was very pleased with these. The biscuits were good, crunchy and buttery with just a hint of coffee, but the ganache was a complete revelation. The method used to make it produced a very light almost mousse-like cream, which knocked spots off buttercream: I shall definitely be using this method again. The coffee flavour was quite strong, but brought out other flavours without overpowering proceedings. These are perfect Valentine’s biscuits, why not treat the coffee lover in your life to some on February 14th. With the Valentine theme very much in mind when making these biscuits, I’m submitting them to Calendar Cakes with Dolly Bakes and Laura Loves Cakes. The theme this month is, strangley, lurve! For much the same reason I’m submitting them to a Valentine themed Tea for Two with Homemade by Fleur. Fleur has a teapot and mugs Red Cornishware set which I am very keen to get my hands on and which she is giving as a prize to whoever Holly (of GBBO fame) thinks has put in the best entry – fingers crossed! For no good reason, other than I made these from scratch and JW is always appreciative, I’m also submitting these to Made with Love Mondays. Classic French, a monthly challenge hosted by Jen of Blue Kitchen Bakes has the theme of ganache this month, so I am making my debut entry with my whipped coffee and chocolate ganache. Crunchy biscuits with a hint of coffee and filled with ultra light moussy coffee cream ganache. 100g of plain white flour. Place all ingredients except the coffee into a food processor and pulse until mixture resembles breadcrumbs. Or rub butter into dry ingredients by hand. Bring mixture together with hands to form a ball. Place in a plastic bag and leave for 1/2 hr or so in the fridge to firm up. Roll the bough out to just under 1/4 cm thickness. Re-roll off cuts and carry on cutting until all the pastry is used up and you have 40 biscuits. Place on 2 baking trays lines with silicone mats or baking paper and bake for 10 minutes at 180C. Add coffee to the bowl one third at a time stirring hard after each addition until all incorporated and smooth. Add cream and stir until incorporated. Use electric beaters to whip the ganache until peaks form. Spread the ganache over half of the biscuits and sandwich the remaining biscuits on top, to make 20. What a nice idea, love the little hearts and the full on coffee flavour is very much to my taste. Thanks Janice, my coffee loving friends really enjoyed them. How long do you reckon these would keep? I’m looking for something I can make on Monday but take into work on Wednesday! Nat, if you make the biscuits and ganache separately, then you can sandwich them together before you go to work. I had the last one three days after I made them and they were fine, but a bit soft. Sounds like a plan, hopefully I will have time tomorrow night to bake them! these look beautiful!! Love them! Thanks Laura. I find Eat Your Books really useful and use it quite a lot, both for baking and general cooking. You can look for recipes with a specific ingredient, or a type of recipe or both, eg lime tart. The downside is, a lot of my cookery books haven’t yet been indexed, so it only covers about half of my collection at the moment, but it is adding to it all the time and there is an option to index them yourself. The picture I have in the book of the biscuit Manhatten is impressive. We are hugely enjoying the Pura coffee too, although I have not done anything apart from drink it! Lovely biscuits, and thanks for the reminder about JW’s Made With Luv, I always forget it, and must submit something! Thanks Helen, the coffee is good. There are far too many challenges out there now and I can’t keep up with most of them. These are so adorable, Choclette, and I love the whipped coffee ganache filling! 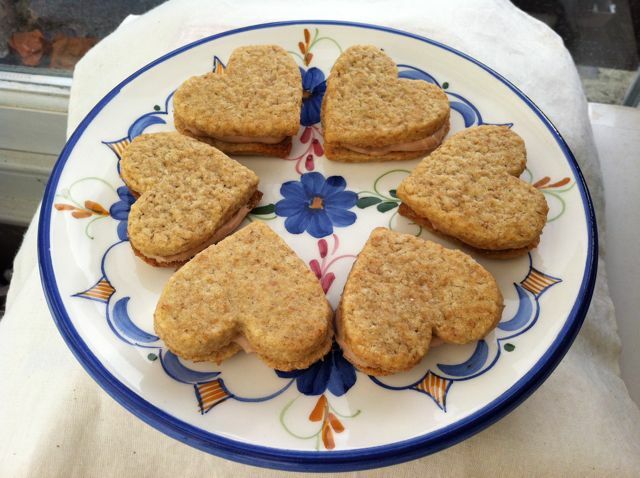 What a perfect treat for Valentine’s Day and I love the presentation of the hearts in a circle… Thank you so much for sharing! Thanks JW. I shall be using that whipped ganache for all sorts of things now, it’s heaps better than buttercream. Well I know I would love these being the coffee lover I am. I think these sound perfect and I have also been making a whipped icing myself this week. Mine involved white chocolate though! Maybe this will convert you to a coffee drinker, d’you think??!! Thanks Nazima, not being much of a coffee lover, I surprised myself by just how good I found them. These rustic delicious biscuits are great with coffee or tea. I’d love to dip them into my coffee… mmm I can almost taste them! Very nice Choclette. I’m a huge coffee fan and these would be fabulous with a morning coffee. Thanks Maggie, it makes me feel I should have coffee mornings more often. Thank you Susie, they have quite changed my mind about coffee flavoured biscuits. Thanks Paula – the whipped ganache was amazing and I have used the technique again already. These look so delicious and pretty! Nothing is much nicer than the combination of chocolate and coffee. Right up my street! Love coffee cream flavours! these are really making me hungry! Can’t believe I didn’t get round to commenting on these sooner. They look fantastic and I think the ganache filling sounds like a really good idea. Thanks for entering into Classic French and I’m happy I provided you with the inspiration. It’s great that us bloggers can all pick up ideas from each other and then create our own unique dishes from them. Thanks for this these look scrummy!